Are you looking for pumpkin recipes to serve to your family this month? Now is the perfect time to buy pumpkin. Many stores have pumpkin puree on sale just time for Thanksgiving. 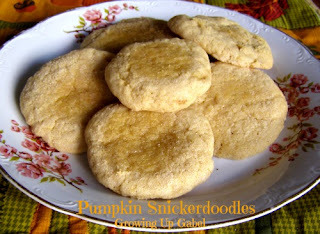 Camille from Growing Up Gabel linked up this delicious recipe for Pumpkin Snickerdoodles on this week's Dare to Share. I think they look so good. When she mentioned they would taste great with pumpkin ice cream, I had to agree.. Now if only I had some already in my freezer. You can see Camille's full recipe on how to make Pumpkin Snickerdoodles HERE. If you would like to be the Feature of the Day, be sure to link up your holiday posts on the weekly Dare to Share party HERE.